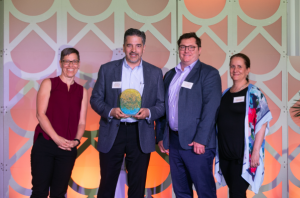 Aurora, IL, USA, April 12, 2019 – OSI was honored by Whole Foods Market with an award for Outstanding Innovation at the company’s annual Supplier Awards ceremony in Austin, Texas. The annual awards recognize suppliers that embody Whole Foods Market’s mission and values through a proven commitment to quality, environmental stewardship, organic integrity, innovation, and partnership. OSI’s Tom Kotsovos and Christopher Hansen accepted the Outstanding Innovation award at the ceremony in Austin on April 10, 2019. OSI Supports China’s ‘Three Sames’ Campaign.